1. Omegas will need at least 5 . top 5 best included basic Ezra ,unique all except Ezra. (I listen to others and maxed Ezra so I had to go without zeb unique which is much better) a 6 choice but not needed zeb basic for more damage 2. Mods health sets with emphasis on health first then protection. I used speed arrows but if ur tanks don’t survive aoe then u will need to use health on arrow. For zeb health potency combo had 55% potency it worked well. 3. Strategy sim 1-3 because stages r pointless and waste time. Stage 4 is higher difficulty so it’s bad practice. Took me 4-6 tries till I noticed death troopers dazing Ezra and zeb meant start over u have no chance. The key is use one of ur tanks to taunt first so u can’t be dazed then take it from there. Use backup plan on tank with low health rotation taunts and take out troopers then the toons that give health and go for thrawn last use assist to stun but it’s easy once ur tank survives aoe and fracture but impossible if it doesn’t and u r getting dazed lol. Seems a little advanced for the new players thread. Lists are a lot easier to read when you actually use line breaks between items. Just saying. Ezra is used on Bastila/Revan Teams and does amazing damage - definitely worth G12+, killer mods and his Zeta. Plus the level you can take Maximum Impact to on Phantom is based on his gear lvl. Kanan - a rare taunting tank with double tag (Rebel/Jedi). Sabine - if you’re new you may not have her at 7* but keep her on a slow background Farm - she has uses both in Phoenix and outside it including raids. I do agree that you need to switch focus away from gearing Phoenix after you’ve unlocked Thrawn with the exception of continuing to gear Ezra and background farm Sabine. You then come back to them later as you push into reaching the top of Fleet. It’s a waste because running jedis it’s late game not mid they will be beat by Phoenix as u can farm to 7* before jedis. Empire don’t use Ezra and u sacrifice fleet rank early to gear him when ships don’t become useful until 7*. about a month or so earlier. Started after these guys so they had 20k advantage on me or so at the time. Started 40k up. They can be useful before that point. 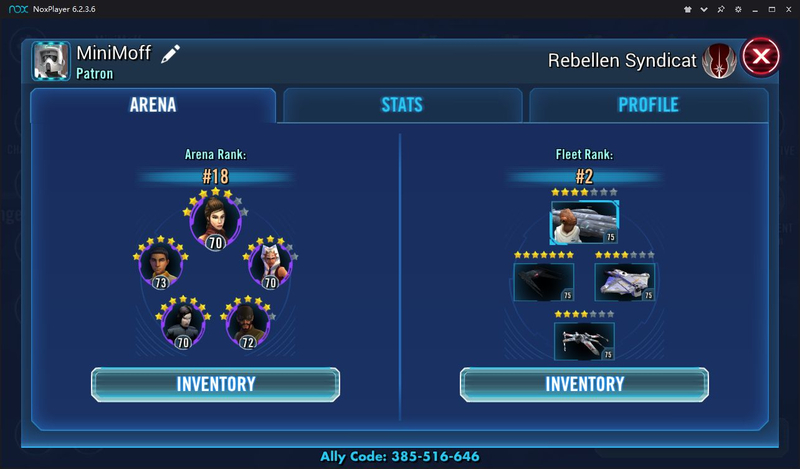 I've farmed KRU in addition to my Phoenix ships early on and held rank 1 in the fleet arena for weeks with KRU, Ghost and Phantom under Ackbar lead and Clone Sergeant on reinforcement. Now at level 75 I'm still holding rank 2 after a whale with Hound's Tooth has taken the top spot. Phoenix teams came around lvl65. Switch to ep within week back around 100 again. Started rank 2k so late to my shard most played a month earlier catching now though.